Received in the mail: Plant materials of various cactus orchid varieties. I was on Facebook one day and I saw Evelyn, one of my relatives who live in Southern California, posted pictures of gorgeous flowers from her cactus orchid collection. Jokingly, I asked her if she could please send me some plant materials. She said no problem. A couple of days later I got a Priority package in the mail. I was ecstatic but I have no idea on how to grow them. Evelyn said they are very easy to grow. The plants don't like direct sunlight. Good drainage is important as they tend to rot with too much soil moisture. After a couple of days: Soil media and pot now hold the plant materials. Temporarily they are sitting in one corner of the back patio hiding from the sun behind a huge Ficus benjamina in an oak barrel. The one-gallon pots seem very small for the lengths of the leaves that I planted. As soon as they get established I will transfer them to bigger pots. Labeling these plants seem to be convenient...just write on the leaves. So here I am feeling as if I adapted children without any experience in raising kids at all. Wish me success or give me some advice. Have a nice wonderful Sunday afternoon in your garden today! Some of pechay made their way to kitchen today. Exactly one month from the time of sowing, the bok-choy in my garden is ready for harvesting. If there is such thing as "fast food" in the garden, bok choy (a.k.a. pechay) is one of them. Bok Choy is a very common vegetable in the South East Asian countries. It is one of the most common vegetables grown in backyard gardens. I grew up eating a lot of them. :) For some reason (nostalgia) I seem to always buy a packet of seeds every year and sometimes I also forget to plant them. I remember the first time I tried to plant this in my California garden. It was summer and I was pleased to see the young plants emerge so quickly. However, shortly after they put on their first pair of true-leaves they "bolted" (flower). Bok Choy is a long-day plant - a lesson I had to learn. As of today the daylength in California is 14 hrs and 33 minutes. So far no sign of bolting has been observed. I wonder what the critical day length is for bok choy. These cilantro plants were just seedlings two months ago... and guess what? They are already flowering. As I said before, it is always a bad news when any crop that is grown for their leaves starts to flower because it means that growth begins to shift from foliage development to the seed production. Well, for cilantro it's not all bad news. So you stop getting the leaves for your salsa but soon you will have coriander seeds for your other recipes. The seeds coming from cilantro are the same as coriander. I am always fascinated by photoperiodism in plants because I grew up and did all my previous research work in the Philippines where the difference between the shortest day and longest day of the year is only about one hour. I remember my Plant Breeder-friend had to extend the daylength by providing light to the potatoes so that they would flower. Without some kind of daylength manipulation some plants grown along the equator will not flower because of the lack of the much needed flowering stimulus - the critical daylength. Have you ever been frustrated with some plants in your yard because they are flowering sooner than you expected? French Breakfast radish: Just pulled out from the ground. Washed and ready for consumption. Today marks the beginning of harvest time for this season. This is the first time I planted the 'Early French Breakfast' radish and I decided that I like it. This radish is elongated and it is red and white in color. The part that's buried seems to have the white color. It is a fast growing variety maturing in less than a month from sowing. (I planted on the 29th of April and today May 26th we are eating radishes!) It has a crisp texture and mild flavor. We ate them plain and they are really good. They can also be eaten as hors d'oeuvres with sweet butter and salt or added in salads and sandwiches. My children ate them with no problem. This particular variety is known to do better in hotter climates like ours than other varieties. I will be planting a second crop of this variety soon. No pesticides were used in these radishes. Some say that radishes seem to deter beetles from infesting cucurbits (such as cucumber, zucchini and squash) when planted close to these crops. This is an unexpected benefit if it's true. Have you had any experience regarding this crop protection attribute of radishes? 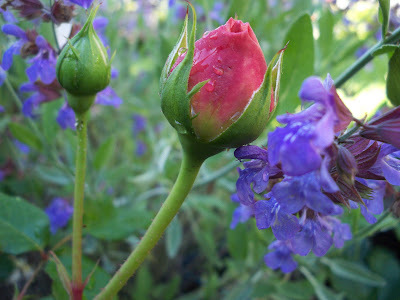 Rosa 'Abraham Darby' flower bud is complemented by the blue flowers of common sage. 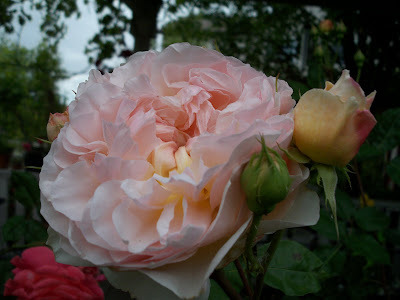 Of the David Austin roses in my garden, 'Abraham Darby' is my favorite. It blooms early in the season with beautiful old-fashioned peach pink flowers, glossy foliage. Compared to 'Evelyn', the flowers of 'Abraham Darby' have less of the yellow tint and the petals are more ruffled. It has a strong refreshing citrusy rose fragrance. In my garden where summer temperatures can get very high, 'Abraham Darby' continues to bloom and maintains its beautiful appearance. It is tolerant to heat and resistant to diseases. So far there have been no signs of black spots and rust. I had this rose for almost five years now. Rosa 'Abraham Darby' is a David Austin (a renowned rose breeder in the UK)-bred rose which was introduced in 1985. It was named after one of the founders of Industrial Revolution. Would you choose this rose for your garden? Sometimes starting seeds directly in the ground can be a little bit tricky depending on the weather conditions. Some of the factors that can affect germination outdoors are temperature, soil moisture, and pests (birds, snails and insects). Low temperatures and insufficient soil moisture can delay germination. Delayed germination consequently result in lower germination rate as some of the seeds loose viability as the conditions shift from favorable to stressful. Sown seed can also be eaten by birds depending on the depth of soil cover. The week that I sowed the seeds was warm and I thought that it would stay that way. On the contrary, the weather got cold the following week; I had to do some remedial tricks to save my seeds. I find it useful to cover the planted area with clear plastic sheet (such as saran wrap) to conserve the heat in the soil and prevent loss of moisture while the seeds are still in the process of germination. Seeds need to imbibe sufficient moisture for the germination process to begin that's why it is important to maintain moisture. Another advantage of putting this covering on the soil is protection from birds and even snails that can eat the emerging seeds. When the seeds have emerged, I removed the plastic covering. At this point maintained soil moisture is still necessary although the roots have now grown to penetrate further into the soil for water. Of the four types of seed planted, the radishes emerged first, followed by bok choy, then basil. The last one that emerged was the corn salad plant. This sign caught my attention as I was walking to Starbucks one day. 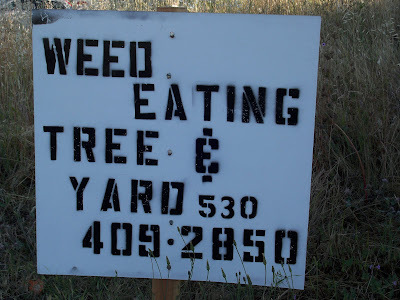 I know what's being advertized here...but doesn't it sounds like there is a tree and a yard that eat weeds? What do you think? This statue appropriately blends in with the rest of the garden and yet it invites your eyes to look. The ivy has found its way to become part of the lady's outfit. This combination gives a sense of connection between the accent statue and its surroundings. There exists an impression that "she" has been there when the garden began. The color and scale of the accent piece add to the overall success of this design. I took this picture from one of the gardens featured in the El Dorado Hills Garden Tour (May 15, 2010). We have been enjoying a lot of flowers in the garden this year. When the kids go out to feed their pets in the morning they often make comments about how fragrant the air is. The strongest fragrance is coming from the orange blossoms but there are several roses that are really sweet-smelling. One of them is the rose 'Evelyn'. 'Evelyn' rose has beautiful flowers. The pictures give a very accurate representation of the typical spring bloom. The color is what I would call peachy-pink. There's a color gradient that goes more intense towards the center of the flower, the outer petals being light pink. In the spring the color slowly fades into very light pink. During hotter months, the color is quite different. They do not have the exciting color gradient. I think that although Evelyn has a very desirable appearance and fragrance, its beauty is not consistent in all growing conditions. In my yard I have two of them. I transferred the one which used to be in my vegetable garden to a different location where it would get some shade during the later time of the day. We'll see how they do when our temperatures rise to 100-115º F come July-August. This year I will try to limit fertilizer application to help shorten the canes and branches. We'll see if it works. So far I have not applied fertilizer to my roses this year. After the first blooms are spent I will fertilize some. 'Evelyn' is one of the David Austin English roses. It resulted from a cross between Tamara (pink rose)and Graham Thomas (yellow rose). I believe it was bred and selected to be(become) the basis of Crabtree & Evelyn's signature fragrance. Just so you know that was not the last pomegranate tree. I will plant another one again. A better plant material will increase my chance of success. One of the first roses I planted in my El Dorado Hills garden is the Eden Rose Climber. It is very easy to grow. When given enough water and regular pruning to contain it where it should be, the plant grows vigorously and resists most of the diseases that are common to roses. I cloned the one I have and now there are three of them in my yard. Eden rose produces large clear pink flowers with the outer petals being greenish white. They look beautiful in my garden now. In some years when the spring temperatures drop after an early warm weather the early flowers fail to open. This rose is not big on fragrance. If you are planning to have a reason to "stop and smell" in your garden, Eden Rose is not it! On the other hand, I would say that this is the rose of choice for exclusive bridal bouquets and wedding arrangements. Although it is called 'Eden Rose Climber' here in the America, in Europe it is simply called 'Eden Rose'. 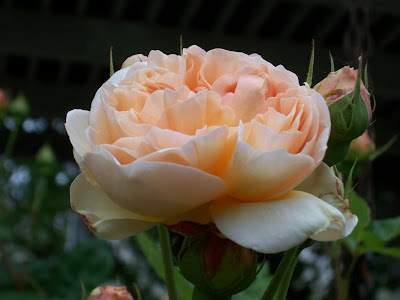 In France where it was bred by Marie Louise Meilland, it is known as the 'Pierre De Ronsard'. Appropriately named after a great French poet this rose is very regal and romantic-looking; it belongs to a class of roses known as 'Romantica' that reflects a period of intense emotional artistic creation (music, sculpture, art, opera, etc.) in French history. I was in my garden the other day and saw these tiny fruits. They look dainty now but soon they can be up to one-pound-size fruits. The fruit of the pear (Pyrus communis) is considered an accessory fruit. Accessory fruits are sometimes referred to as false fruits because technically, the fleshy part of the fruit that we eat is not the fruit. Instead it is the enlarged receptacle. The fruit is described as the ripened ovary. In the case of the pear or apple the actual fruit is the core. If you look at the picture above, remnants of the flower other parts are still visible and yet the receptacle is obviously in the process of enlarging. The receptacle will continue to enlarge and envelop the developing fruit (core) which contains the seed. Thanks to the receptacle or else the pear fruit would be of little food value. To understand this concept better, look at the illustrated parts of a flower. 1. Orthodox seeds are those that can withstand drying and freezing after maturity. For example corn (Zea mays) and beans (Phaseolus vulgaris) are traditionally dried after harvesting and sometimes they may be kept in low-temperature environment for storage. This process helps maintain the viability of the seeds for a longer period of time. Most annual plants have orthodox seeds. As the seed matures, its moisture content decreases while dry matter content increases. 2. Recalcitrant seeds (as in avocado) lose their viability when their moisture content is reduced to a certain level. Unlike the orthodox seeds, drying and freezing recalcitrant seeds damage the embryo. Examples of plants with recalcitrant seeds are mango, cacao, and avocado. As the fruit matures, the seed moisture content increases. At this point the seed is capable of germination. Recalcitrant seeds should not be dried after they are extracted from the fruit. Germination is the sequence of events in a viable seed starting with the imbibition of water that leads to the growth of the embryo and the development of a seedling. This is the time of the year when my Cecile Brunner rose is at its best. It blooms with a showy display of dainty pink flowers in the spring. My Cecile Brunner rose is strategically located next to the front door the house where it climbs on one of the entry-way columns. The flowers are mildly fragrant but with so many of them they make a sweet statement giving a pleasant welcome to anyone who approaches the house. Cecile Brunner is supposed to bloom repeatedly till fall but the high temperatures in El Dorado Hills (our area) seem to reduce and sometimes inhibit flowering in the summer. Cecile Brunner is a polyantha rose. (Polyantha implies a small vigorous plant that will cover itself with trusses of tiny blossoms.) According to literature, this rose was introduced in 1881. Tiny 'Tea Rose' shaped blooms, under 2 inches in diameter, are coral pink. It has thorns on its stems which couild be very sharp. Based on my experience, it will flourish even in marginal soil or partial sunny conditions. My Cecile Brunner is obviously a climber but traditionally, it is a compact shrub. The climbing Cecile Brunner is not for small spaces. If you must have them, then make sure to prune it regularly. This is a vigorous grower. Years ago, I planted two of them in one corner of my yard. Eventually, it got so heavy that the arbor that my husband built to support it collapsed. In addition to that, it also covered and choked my Fuji apple which was growing next to it. We had to dig them out and allowed the apple tree to flourish. A fact about the avocado seed. The avocado seed is a recalcitrant or homeohydrous seed. Recalcitrant seeds are those that cannot withstand desiccation or drying and freezing. An avocado seed would loose its viability when dried. (Viability is the ability of a seed to germinate.) When you are planning to grow an avocado from a seed, it is recommended that the seed be kept moist until the new plant emerges. 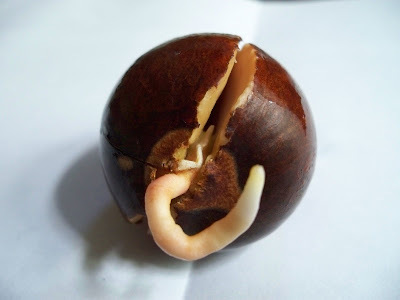 How to germinate an avocado seed? This is the only method I use to germinate avocado seeds. It works all the time and it is very easy. This is better than directly planting the seed in the ground especially in dry places where sufficient soil moisture is hard to maintain. 1. Take the seed from a ripe avocado fruit. 2. Immediately wrap the seed with wet paper towel. 3. Place it inside a sandwich bag and seal. 4. Place the sealed plastic bag with the seed in a warm place (near the window or fridge). 5. Wait for several weeks until the seeds cracks. Do not allow the paper towel to get dry. 6. Continue waiting until the radical (the first root) comes out. 7. At this point you can plant the seed in a pot or directly into the ground. This procedure is far more effective and a lot easier than the "toothpick" method. This is an interesting bark display on a birch tree which I see often as I walk to Starbucks on most mornings. 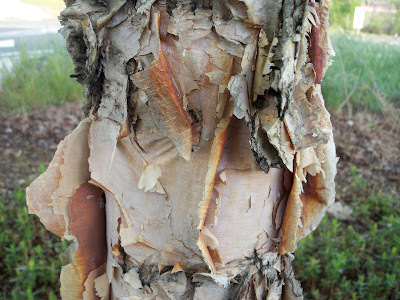 For this tree, the peeling bark coupled with its soft earth-tone coloration is definitely its most distinctive feature. I wonder what variety of birch tree this is.